CD 1: If I Only Had the One I Love; Sheep-Crook and Black Dog; The Game of All Fours; I Don't Want A Girl; All Over Those Hills; The Atching Tan Song; The Banks of Sweet Dundee; Barbry Ellen; The Bird in the Lily Bush; Betsy the Milkmaid; If I Were a Blackbird; A Blacksmith Courted Me; The Blue Eyed Lover; The Bridgwater Farmer; I Am a Brisk Young Lad; Buttercup Joe; The Butcher Boy; Catch Me If You Can; Clementine; On a Cold and Winter’s Night; The Cows is in the Clover; The Cuckoo; Diddling Song; Fair Wackford Street; Erin Go Bragh; Erin Go Bragh; Fair Ellen; The False-Hearted Lover; The Folkestone Murder; We Dear Labouring Men; Irish Molly-O; Georgie; The Girl I Left Behind; Still I Love Him; Flash Gals and Airy Too; Go and Leave Me; All You Paddies Lay Down; The Pretty Ploughing Boy; Once I Had a Good Little Boy; The Running, Running Rue; The Jealous Lover; The Famous Flower of Serving Men. CD 2: Green Grows the Laurel; Henry My Son; Billy Boy; The Rich Farmer From Chesfield; I Was A Reckless Young Fellow; The Irish Girl; Betsy; In My Father's Garden; The Prentice Boy; Jel Along; The Jew's Garden; The Jolly Herring; The Blue Jacket; The Little Ball of Twine; The Little Chimney Sweep; Little Poppa Rich; Bold Dollery; Young But Growing; Bold Robert Emmet; Mandi Went to Poov the Grais; McCaffery; My Boy Willy; My Love Cold Beneath My Feet; The Broomfield Hill; The Broomfield Hill; The Lady and the Soldier; Two Pretty Gypsy Girls; The First day in October; The Old Riverside; Old Tom Cat - Rackymandoo; Once I Had A Colour; Johnny Doyle / The Green Bed; Child's Rhyme; The Oyster Girl; The Green Bushes; Riddle; Three Long Steps; The Little Beggar Boy; Sweet William; Twenty-One Years; The Three Butchers; Bell Bottom Trousers; Died For Love; Final Speech; Space - fragments: Lord Bateman; The Dark Eyed Sailor; Brennan on the Moor; The Black Velvet Band. 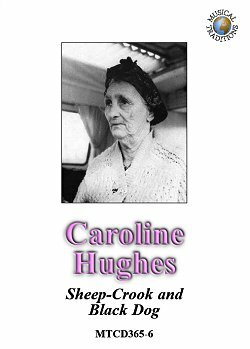 Caroline Hughes, respectfully and affectionately known to her Traveller community as Queen Caroline, was born in 1900 in a wooden, horse-drawn caravan in Bere Regis, Dorset. So begins the story of a passionate, eloquent and witty woman whose singing has influenced many a revival singer of traditional songs. She died in 1971. I first heard her on a Folktracks cassette, recorded by Peter Kennedy in 1968, when her voice was showing signs of struggle and roughening, though still full of character, power, skill and conviction. Earlier, in 1962 and 1966, Ewan MacColl, Peggy Seeger and Charles Parker recorded Queen Caroline and other family members, and those recordings form the basis of this present collection which goes far deeper than singers and songs. It paints a warm and vivid picture and allows us, Gorgio or Traveller, to experience part of a culture and a time that Caroline describes with passion and pride - a love of her Romany life. These 91 songs make wonderful, enjoyable listening. The muffled traffic noise, shouts of the children and the distant beating of metal against metal (surely a blacksmith!) plus the odd interjections from family singers is a soundscape delight and creates an ambience that draws us in. At no point does it detract from the singer or the song. The sound quality is good overall although we perhaps deserve better quality CD blanks. Her emphatic, measured delivery gives pulse and rhythm to her singing, but also to spoken word and recited texts. Caroline learned her songs orally, absorbed from her parents, family and other Travellers she met at gatherings, and shared her songs in the same way. The recordings include fine performances by other family members - Caroline' s daughter Sheila interestingly shows a country and western influence not present in her mother's style. Caroline's singing is characterised by a rich tonal quality, sureness of pitch and detailed clarity of melody. She rarely uses the microtonal sliding loved by other Travellers but glories in terracing - the holding and emphasising of top and bottom notes of a tune. Percy Grainger called his singers 'creative artists' and trusted the purposefulness of what they sang. Caroline was indeed an artist. In addition to the extensive and satisfying quotes from the MacColl and Seeger 1977 book of Travellers' songs, which add so much to the atmosphere of this collection, the booklet offers thought-provoking comments by Rod Stradling, meticulous transcription work by Danny Stradling and, blessedly, no attempt to rationalise or explain less coherent texts. Thanks to MT and Peggy Seeger for giving us access to a wonderful singer, her words and her world.